I’m gonna go ahead and copyright some of this stuff… some of it’s going in the book. ~sigh~ She’d better out grow that phrase before teenage-hood. Cause I’m going to lock her in a closet until she’s 40 if she doesn’t. Sophie serves coffee at her tea parties… not tea. She calls them tea parties, but sure as rain, it’s coffee she serves us. We are raising her right. Bocephus has either smuggled a trampoline in with him or he’s bigger than he should be and is stretching…. a lot!!! Monkey flipping sucker punched my lung earlier today! I wasn’t amused until Dan felt him stretch tonight. Evil child, BUT at least Dan got to feel him/her (??). Dude, Sophie just asked Dan what his quest was. Parenting: when you’re doing it right! So this morning I woke Sophie up to tell her we were finding out if the baby is a boy or a girl… She said “it better not be a boy.” Well the mini-me is about to be disappointed but Dan and I are thrilled to say, late June we will be welcoming Archer Brown-Blake into this world. It’s going to be a mini-Dan this time!!! Photos this evening. Guess who is thrilled she’s have a little brother now and can’t stop talking about how we have a princess and a prince now? Parenting (aka bribery): When you know you’re doing it right. Picking Sophie up from school yesterday, I learned exactly how awesome she is. As an aside, my kid knows the words to “I miss the misery” by Halestorm. My kid is pure awesomeness. yup, Dan and I were destined to be married and raise a child like Sophie. Cause we both just feed her weird. So Sophie has recently started fake burping and prolonging the burp. (she has a ton of boys in her class and her closest friends are boys… God help me). 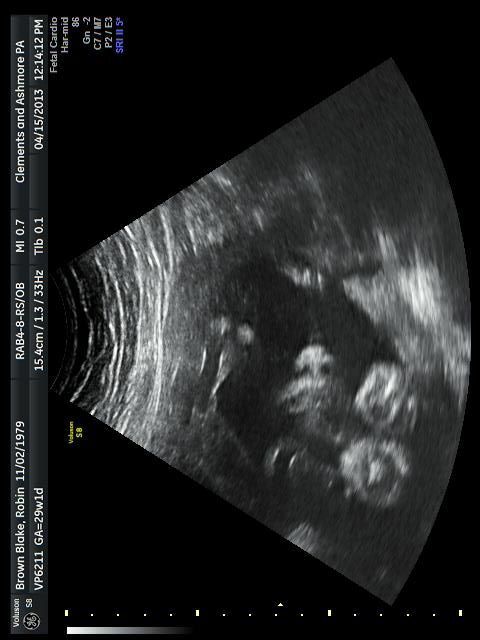 So she did that burp in my face this afternoon. Rather than getting mad, I channeled my inner Gru. As a side note, I think she’s seen that movie (Despicable Me) a few too many times that she knows what I’m quoting and the preface of the rest of the movie. Dan got home and got in his gym shorts, and then Sophie ran up to him and hugged him around one of his thighs. Today is Sophie’s 4th Remission Anniversary!!!!!!!!!!!!!!!!!!!!!!!!!!!!!!!!!!!!!!!!!!!!!!!!!!! (I count this one over the “last chemo anniversary, since she was on chemo so long after remission). If it wasn’t so gross out, we’d hit the park, but instead we are going to Michaels to pick out ribbons for her hair, and hit the mall for Orange Juliuses, and then probably hit the red box for a cool kid movie. Tonight? Mac and Cheese, Hot Dogs, Twizzlers and cake, Why? Cause That’s Sophie’s fav. My kid is the coolest kid ever. Sophie asked for… or demanded, BACON WRAPPED HOTDOGS for her remission anniversary. Sophie is SUCH a Floridian!!! She saw the hail fall from the sky, and Dan brought some in to show her. And her response was PRICELESS! Sophie: “OH NO!!! THE SNOW WILL DESTROY OUR HOUSE!! !” ~runs to her room~ Not sure we will be visiting Maine in the winter while she has this kind of reaction. Come home to find Sophie AND Daniel watching an old batman cartoon. ~sigh~ my children. Sophie gave her teacher the evil eye and her teacher told me she actually got the shivers. I told the teacher that I thought that was awesome. I’m not sure if she got what I was saying, but the timing was impeccable. 1. Dan wants to spoil his son in an annoying way (aka more stuff… ugh). 3. Spending time cleaning out my grandma’s house has made me not want anything around me that is not necessary and that I don’t actively use on a regular basis. Dan ended up sulking. BUT the list is short and concise!! Only what we need to make him happy, healthy, and comfy. Oh, and a pair of skull and cross bones socks, so cute!! As a side not, it is disturbing how few baby boy clothes are out there with goth/punk type patterns. I mean elephants and giraffes are cute, but nothing’s cuter than a baby boy with a mohawk in a skull and cross bones teeshirt. Admit it. If Zola wants to go out or wants attention she gets her 100 lb doberman body in your face (face level) and just STARES INCESSANTLY. I swear, it’s so bad I can FEEL it. Doing it to me for the one million, nine hundred and seventy five thousand, eight hundred and forty sixth time THIS WEEK, I turned to Dan (on his computer… of course the dog doesn’t stare at him, even tho HE likes her and I do not right now). Next I will just bean the husband in the head with the remote. Sophie splashing around in the bath, making a mess AND a ruckus. Dan pulls food out of toaster oven after reheating it, and immediately pops the food into his mouth. Dan: ~silent agreement~ (I’m assuming. He was quiet. I take that as agreement). 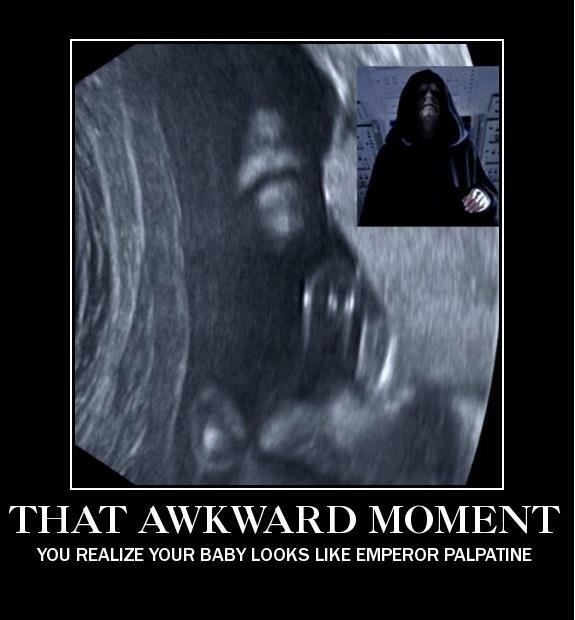 Proof that I have just enough evil in our family to become the ruling family of the Sith Lords. Gorgeous drive up 319. Georgia countryside is some of the most stunning in the world. 1-75 is under construction again. Why is it always under construction? Sophie got car sick on 441 in GA. So we spent an hour in the parking lot of rite-aid stripping everything down… Except me unfortunately… I just got to wear it for the rest of the drive. Benadryl made cranky-Sophie even crankier. 1-85 is under construction again. Why is 1-85 always under construction?. And why can no one in SC drive? Saw a terrifying accident. You know those tiny posts with the wires between the separating the north and southbound traffic? Apparently it CAN stop a semi at 70mph. Thank god. No one hurt. Semi torn up bad. After 14 hours, finally in the right city, staring at the right weather and surrounded by people who have a familiar accent. I think that’s the best description of me I’ve heard in my life. Still learning every day. I have a wealth of teachers that you wouldn’t expect. It made me think of all the things I learned and from whom. My mom: Taught me how to be a lady (though honestly I should practice what she taught more!). Daddy: Taught me to laugh at everything… everything… seriously. Everything. Cause taking anything in life, including yourself too seriously, is a sad, empty existence. Daniel: Taught me what real true, romantic love feels like, and what it means to love myself (if not all of me, at least most of myself). Sophie: Taught me to never ever ever give up, even when the odds are against us in a downpour hurricane with the winds blasting from all sides. One of my coworkers today: Taught me to not forget where I have been, cause history repeats itself and I may be there again. Sometimes it’s a bad thing, but in this case, if history repeats itself it will only be a blessing. I truly love the people I have in my life, my family, my friends, and my coworkers. I am blessed. Sophie has this strut that my grandma would have called the washing machine walk (watch the agitator some time and you’ll get it)… so she struts by the bedroom door where I’m sitting, and doesn’t even pause. That, ladies and gentlemen, was your random for the day. Thank you and goodnight. Dan: “I found a sheet of felt today.” (I was looking for some earlier). A friend tells me I’m like a dented can of corn sold for 79 cents at the dent-n-save. My mom tells me that I’m the one holding the matches when the firetruck shows up and there’s no one left to blame. A co-worker declares that I’m the type of person that wouldn’t girl fight, but more likely to grab someone by the head and slam their forehead into the corner of the desk. My boss tells me that he feels the need to put me in a choke hold sometimes and rebuffs my declaration that it’s assault and therefore a felony while I’m pregnant… apparently a choke hold is only an assault on people who don’t deserve it. Sophie: “SQUIRREL!! !” pointing out the window. Me: “I bred with Daniel. why am I surprised?” (to myself). 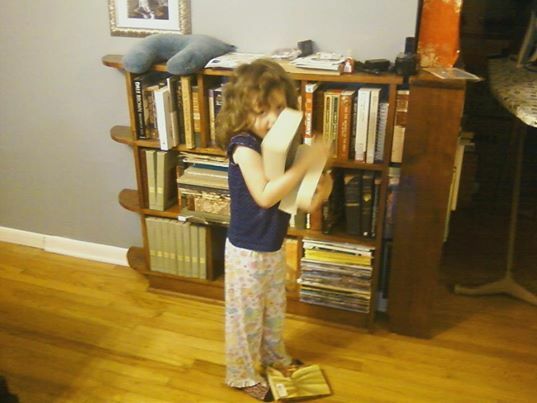 It was real quiet for a second, and I got suspicious… went looking for Sophie and found her piling up the books she’s “going to read to her brother.” All Harry Potter books. I’m proud. Not cause they are Harry Potter, though that is pretty cool, but because she’s 5, and just wants to swim in the books like her mommy. Bookworms Unite!!! 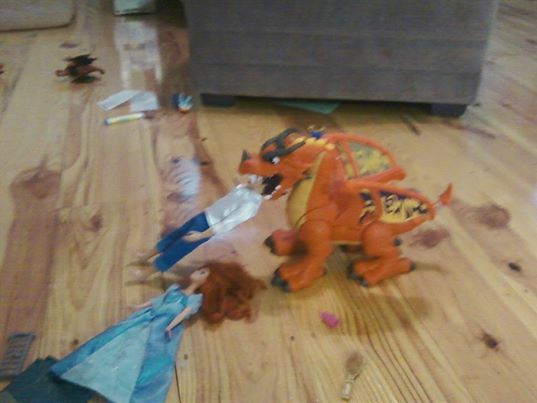 One of Sophie’s cousins (Dan’s side of the family) put the Prince’s head in the dragon’s mouth. Proof that Sophie got the crazy slightly homicidal genes from both sides of the family. This.Is.Awesome. Yeah…. Can’t make this stuff up if I wanted to. And that’s going into the book. For the Easter party held yesterday, the kids were taught a song where they have to hold their fingers up as a cross and sing “This is the cross where Jesus died.” Then there are other hand symbols with other lyrics following that part. Sophie did her own version. uhhhh…. yeah…. We helped her with it and she got it right, but then focused on the wrong part… the dying part rather than the rising part. Sometimes I swear the kid is a little too aware of mortality… We shouldn’t ever tell her about people dying. Ever. But I still have an image of Jesus sitting at a table at Denny’s doing a crossword. I don’t know why Denny’s, but that’s what’s working for me. cool new trick with Sophie. If you compliment any of her paintings, etc… she will answer with “I am an Arteeeest!” (fake accent included). Another bad@$$ BB kid is on the way. Proof: Godsmack comes on the radio in the car, and Archer goes from 0 to bouncing TO THE BEAT. Sophie loves Halestorm, Archer loves Godsmack. Parenting win. You are all welcome. Only did 2 months because my computer thought it couldn’t take it and was all wonky a couple of times. Next Post Monday Sophie-isms early afternoon.